A couple weeks ago I had the privilege of tasting the fruits of labor of those having judged over 4,000 wines for the L.A. International Wine & Spirits competition. 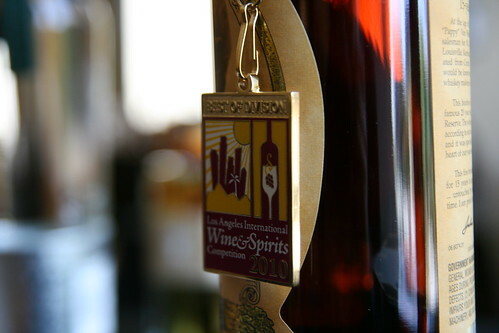 Originating at the L.A. County Fair 71 years ago, the competition arose out of awarding medals to the finest California wines. Since then, it’s expanded to not only international wines but liquors and even olive oils. The competition is also symbolic of a love of wine from all different walks of life, including the sports star power of Tommy Lasorda, Mario Andretti and Greg Norman – who are all entrant winemakers. And let’s not forget Francis Ford Coppola and his winery. How very L.A., indeed. The L.A. County Fair this year is from September 4 – October 3, 2010. So make sure you aren’t out of town during that entire time so you can take advantage of the tickets should you win. I think the most exciting part are the vouchers to the wine-tasting seminars at the Fair. OK – free booze is great, too. 😉 But you might as well learn about what you’re drinking, while you’re at it, right? So, you can enter a total of 2 times!Â Contest is closed a week from today, July 4,Â at 4 PM. At that time I’ll pick the winner using a randomizer. Then, I’ll contact you to get address info, and the goodies will be shipped directly to you. Good luck, and have a great weekend!